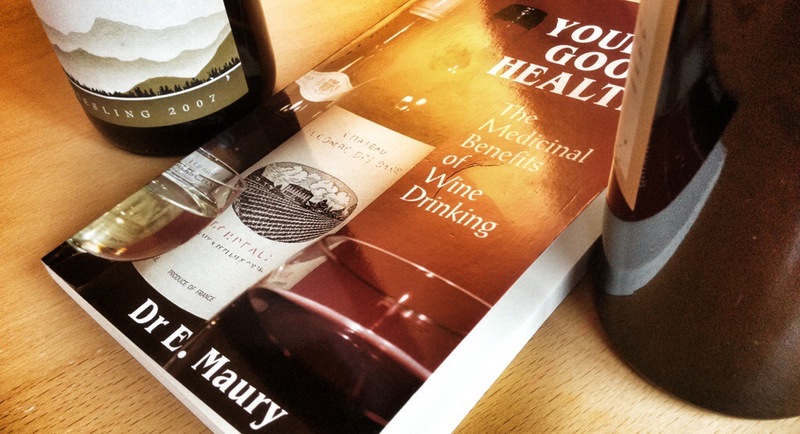 “The theory proposed in these pages might seem, to any rational mind, to have emanated from an imagination heightened by an abuse of Bacchic libations,” writes Dr E Maury, in his epic work of bonkers medicine Your Good Health!. And he’s not wrong. Fully 21 years after its publication in English – Dr Maury is, as his prescriptions make pretty clear, French – I received an email from a marketing person at the publishers, Souvenir Press, asking if I’d like to read it. This is unusual enough in itself. Marketing people tend to lose interest in something within six months of its coming into existence, and here was someone still plugging away half a working lifetime later. As it happened, I did want to read it. This, after all, is a book that promises to reveal “the medical benefits of wine drinking”, and that is something that my conscience could really do with knowing all about. Happily, one of the book’s first conclusions is that a person who weighs 11 stone, eats a balanced diet and exercises moderately can safely consume a litre of light wine – around 10% alcohol – every day. “But normally, in view of the sedentary life most of us lead nowadays, wisdom dictates that we should limit ourselves to three quarters of a litre of wine at 11% strength,” he writes. “For women, the optimum amount should not exceed half a litre.” I’m a fair bit heavier than 11 stone, and go to the gym several times a week, so even though real wine normally weighs in at between 12% and 14%, in my case a full bottle per day should be absolutely fine. A doctor says so. I have read the relevant passage to my wife. In Mauryworld, drinking wine with food is not just acceptable, but basically mandatory. “A meal washed down with tap water is an unfortunate error in taste and a grave dietary error” which can not only cause indigestion but also has a “negative influence at a psychological level which may encourage a tendency to pessimism and introspection”. Add to that the fact – and I use the word “fact” in the loosest possible sense – that modern urban living, which “forces most people to eat out at least once a day … most often in a hurry, amid jostling crowds … swallowing at record speed foods pre-cooked in the bowels of vast industrial kitchens … affects the balance of the autonomic nervous system and leads to a condition of stress”. A sandwich and a couple of glasses of water once sounded like a perfectly normal and probably reasonably healthy lunch. Now I know it’s a recipe for a life of stress, pessimism, nervousness and introspection, I’ll be sure to sit down each day to a proper luncheon with a couple of glasses of wine and a sneer in the direction of the unenlightened stressballs scurrying nervously past on their way to Pret a Manger. So now we know wine is healthy in a general sense, we need a few specifics. So let’s take the wines of the Medoc, which seem to be the most medically efficacious of all. They’re great for curing diarrhoea, thanks to their generous tannins which “tone up the smooth intestinal muscles and help to restore the rhythm of contractions” (sweet Vouvray is the drink of choice for the constipated – “a quarter of a bottle per meal is an effective and reasonable dose”). The Medoc’s wines also have a healthy dose of phosphates and iron, which promote the elasticity of your stomach muscles (though not as much as Champagne, No2 on the Maurylist of all-time most healthy wines – “the expulsion of gases through the mouth bear witness to this”). Other good reasons to stock your cellar with Bordeaux: it “supplies patients with vitamins”, “plays some part in purging the blood of cholesterol” and “slows down the production of histamine”, plus it’s also handy when you’re suffering from a virus, because of the ferrous oxide and organic phosphorous, and the “oenotannins which give it antibiotic properties”. So when you’ve got a virus, or if someone you know has one, or if you’re worried about catching one, half a bottle per day of a decent Bordeaux – or a Beaujolais, apparently – is mandatory. If I had a criticism, it would be that Maury has a tendency to use as evidence convenient quotes from people who wrote in the 17th century or earlier – the opinions of Pliny the Elder, say, or St Paul, whose medical knowledge probably doesn’t stand up to the most rigorous of modern examinations. And the language can be a little bewildering, suggesting it was written a lot more than 21 years ago. Take this, for example: “In countries where oenology has an honoured place, people would not dream of eating a meal, however modest, without the accompaniment of one or more glasses of the potion that is sacred to Bacchus.” You what? And if I’m being really picky, I’d probably pick up on the fact that Maury is “a homeopathic doctor” which – and I don’t want to traduce any honourable homeopathic physicians here, and there may be some – is a phrase that my brain immediately translates as “the kind of doctor who makes stuff up”. Britain’s chief medical officer, and the 2010 House of Commons Science and Technology Committee, are united in considering homeopathy to be “scientifically implausible”. Well stuff them, I’m going to force myself to plause it. This is my kind of science. Now where’s the corkscrew? I’ve hardly had a glass all day, and it’s nearly lunchtime. Lives are at stake here. You can buy the book second hand via Amazon here.